A new dedicated web portal for space research in Europe will soon be launched — Hatch — and this portal will make the findings of the European space projects available to professionals in the field, interested citizens, journalists and educators. The portal is a Coordination and Support Action of Horizon2020. Following a rigorous assessment process, the HATCH consortium was selected and tasked with implementing the project. The consortium comprises participants from across Europe and represents 4 SMEs and one technology centre. It was assembled by Catena Space in the U.K. using their networks and experience in collaborative research and development. This institutionally-funded project will function as an archival and outreach tool for compiling and disseminating the results of the European space projects to a wide group of users including educators, scientific journalists, researchers and industry stakeholders. The portal is a Coordination and Support Action of Horizon2020. Following a rigorous assessment process, the HATCH consortium was selected and tasked with implementing the project. The consortium comprises participants from across Europe and represents 4 SMEs and one technology center. It was assembled by Catena Space in the U.K. using their networks and experience in collaborative research and development. The consortium was selected to highlight the dynamism and aspirations of smaller companies, especially with respect to working with highly advanced digital technologies. 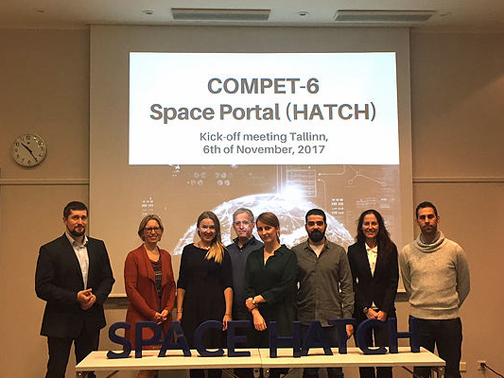 Gisèle Van Bunnen, the Project Officer of the HATCH project, said he expects that HATCH will be the platform of reference for all those interested in European space research, both citizens and professionals. He hopes the portal can lead to new partnerships and facilitate exploitation of research results. Ed Chester of Catena Space added that it was exciting to realize we had a ready-to-go consortium of perfectly-sized organizations. Working with mismatched business profiles in a development project can create unwelcome dynamics: HATCH brings focused small companies together with very complementary expertise, and adds some specific leading ‘big data’ competence from a technology center that all know very well. This team has already expanded the scope and potential of the original brief... and we’re only just getting started. The team members have extensive experience in the space sector, business management, technology, web development, digital communications and strategy. Most members of the consortium have previously worked with each other. Blue Dot Solutions (Poland) Operates a nationwide space domain dissemination portal including the most popular space-related Polish-language website. It also provides web project services to ESA. Catena Space (U.K.) Combines space sector expertise and technology development with business analysis and management. It is active in public engagement, technical space training, strategic support and aerospace R&D. Eurecat (Spain) The principal technology center of Catalonia, providing the industrial and business sector with differential technology and advanced expertise in a wide range of disciplines to respond to their needs for innovation and enhance their competitiveness. WATERDOG mobile (Portugal) An experienced design and delivery service for advanced communication platforms including a fully digital national newspaper in Portugal. WIT Berry (Latvia) An international digital communications consultancy firm. It offers a multicultural user experience and brand concepts. The HATCH project was launched on November 1, 2017, and is expected to last 20 months.